The original Associated Press caption for this image, under the header “Football College Game Action Yale Bowl Yale vs Westpoint”: “At Yale’s bowl, New Haven, Conn, with a score resulting in 7-7. Woods of the Army, making forward pass to Neale of Army fourth quarter, who makes a gain of forty yards on Oct. 28, 1922.” It was Army’s second non-Navy road game ever; the first was a loss at Yale Bowl the previous year. If your idea of college football history is watching an ESPN special on the Miami Hurricanes of the 1980s or enjoying the occasional Dish Network commercial, sit this post out. The iconic Yale Bowl, which hosted the nation’s greatest college football teams years before the NFL existed, is celebrating its centennial this season, and the Army Black Knights — which also boast plenty of black-and-white photos in their media guide — will pay a visit Saturday, continuing a football series that’s even older than the stadium. • Army hosted Yale for the first time in 1893, losing 28-0. The Bulldogs went 10-1 and claimed a national championship that season. Princeton also claims a share of the crown, having finished the year unbeaten and defeating Yale in the season finale. Thankfully, it only took big-time college football a scant 121 years to come up with a playoff system to avoid such problems. • Later that year, Army played only the second road game in school history, falling at Navy 6-4. 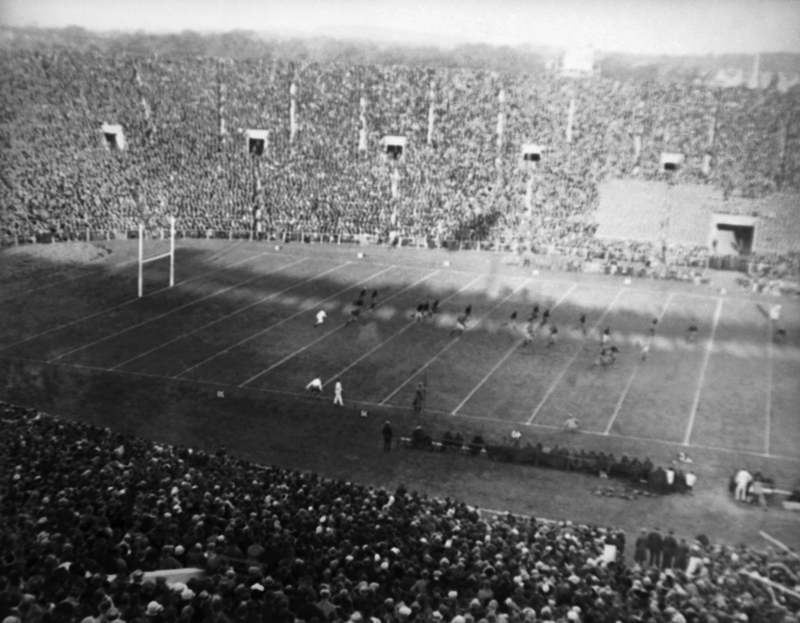 The team wouldn’t hit the road again until 1921, visiting the Yale Bowl. Army lost, 14-7. • After a 7-7 tie at Yale the next year, Army returned to the Bowl in 1923 for what Yale says was the most-watched game in stadium history. About 80,000 fans saw Army lose 31-10. • The 1931 Army-Yale game ended in a 6-6 tie, a score that’s not even mentioned in most accounts of the contest. While attempting to get past the long-since-outlawed “flying wedge” blocking formation used by Yale on a kickoff return, Cadet Richard Sheridan broke his neck. He was stretchered off the field and taken to what was then New Haven Hospital. He died less than two days later. Learn more about the incident and its aftermath here. • The series continued at irregular intervals through 1943, picked up again for two years in 1954, then went dormant until 1985, when Army downed the Bulldogs 59-16 at West Point. Army won again the next season, won 33-18 in its last trip to the Yale Bowl in 1988, and beat the Bulldogs 39-13 in 1996 at West Point, the last time the two legendary programs squared off. • In a series that predates the divisions, subdivisions, conferences and TV-directed scheduling practices that have cropped up since, Yale holds the overall edge at 21-16, with eight ties. Before any rival academy fans gloat, the Bulldogs are 5-4-1 vs. the Midshipmen all-time and beat Air Force 17-16 in 1980 in the schools’ only meeting. Saturday’s game starts at 1 p.m. and will air on Fox College Sports Atlantic.